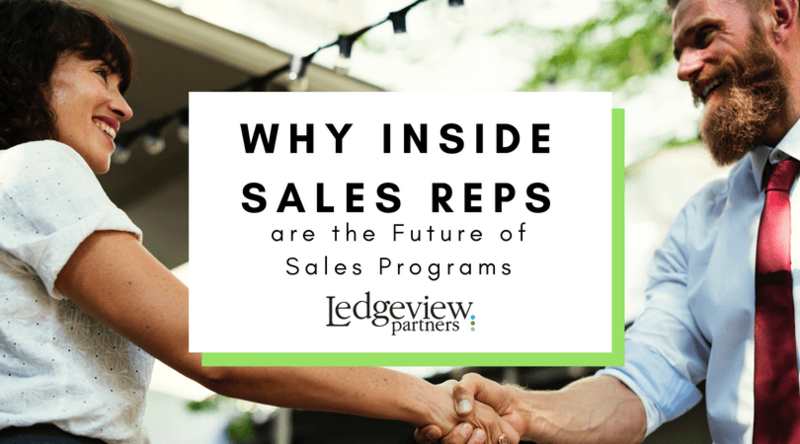 When you truly understand the role an inside sales program can play within your organization, you can begin to identify the facts around what makes a successful program. According to Dave Elkington at Inside Sales.com, Inside Sales Programs are growing 300% faster than Outside Sales. It’s not a surprise, then, that organizations across industries and of different business sizes are continuing to ramp up their investments with inside sales! With Inside Sales, the more information you have at your disposal, the more likely you are to succeed with it. Inside Sales Reps and Programs are certainly the future looking at sales teams, processes, and strategies. They are an integral part, surely, but are not the only part. In Ledgeview’s new eBook, we provide the insight and tips you need to build, revitalize, and grow a successful Inside Sales program unique to your organization. Take a deep-dive into the future of sales with Ledgeview. Greg Dove, Director of Business Consulting at Ledgeview Partners, attests to the power of Inside Sales Programs. “I think Elkington’s statistic shows that while many companies adopt and understand the benefits of inside sales early on, it is still a very present trend that continues to evolve and show its relevance over time,” Dove says. The future is clear with inside sales. The facts don’t lie. THere is a lower cost per sales call with inside sales at only $50, whereas an Outside Sales Rep call comes in at about $308. As you can see, an Inside Sales Program is not only huge for cost-savings but efficiency when it comes to making calls to customers. Since it takes about 8 attempts to reach a customer, Inside Sales Reps can focus solely on reaching them, which cuts these attempts almost in half. This makes processes much more efficient, allowing Outside Sales Reps to work on bigger clients and opportunities while Inside Sales Reps can work on upkeep and administrative tasks. Inside Sales Reps can more effectively reach customers for a variety of reasons, but the primary one is their focus on this task. Though high-end solutions are predicted to take over the sales process in the next few years because of the growth of the digital world, customers still need consultants because they provide the guidance and human interaction customers need. Inside Sales Reps will help move your customer through the buyer journey while increasing your sales team’s efficiencies. The future is still human despite the digital world in which we live, and Inside Sales Reps are the people that will help you fly! Learn more about creating an effective Inside Sales Program in Ledgeview’s new eBook, “21 Tips to Building a Successful Inside Sales Program.” We cover everything from best practices to key benefits to doing things right. Download the eBook here to get started.